Download the Danale App ,client can view up to 4 live camera on one screen. Keep track of what's going on in every room of your house or small business, and feel rest assured that you won't miss a thing. 【SMART MOTION DETECTION AND CLOUD SERVICE】:With the help of smart motion detection IP camera,real-time alerts are send to your phone immediately when motion is detected. Which give us reliable security and surveillance for home or business.In addition,Support the highest level of security Cloud storage, store your video screen, others are not authorized to watch; support for up to 64G SD card for local storage. 【RELIABLE 2.4G WiFi CAMERA】:Easy to install,using "+" via Danale App on your mobile phone and follow instructions step by step, no complicated setting needed of this wireless surveillance camera.When it is matching code please wait a few seconds patiently.Important tips before connection:IP/Network-2.4GHz Wireless(Incompatible with 5GHz),make sure your mobile phone is connected with the same 2.4G wifi. It needs to power up all the time when record. 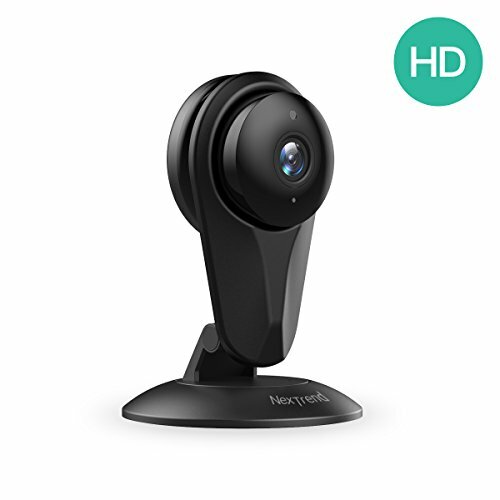 【WIDER VISION & MULTI-VIEW】: Level 360 degree, 150 degree rotatable,with an adjustable base(Can be adsorbed in any place with iron）, you can manually adjust the viewing angle, use one wireless IP camera to capture an entire room without ever having to pan or tilt. Multi-view for several home cameras monitoring at the same screen, so you won't need to switch one camera to another to check what happening for a certain camera. 【EXCELLENT DAY /NIGHT VISION & CRYSTAL TWO WAY AUDIO】: Intelligent IR-Cut switch ensures clear and high quality images day and night.10 IR LEDs, night vision up to 30 feet in pitch dark. Built-in Mic and Speaker offer you a smooth conversation with your family at anytime, anywhere with your mobile phone or PC. 【EXCELLENT COMPATIBLE AND RELIABLE CUSTOMER SERVICE】:Supports remote viewing via iOS/Android mobile devices, Windows PC, Apple Mac system.ANY PROBLEMS, PLEASE SEND EMAIL TO nextrend008@hotmail.com or CALL TOLL FREE +1 8779779688 after 5 PM(PST). Free return & exchange service within 30 days, free technical assistance and 1 year warranty. Our friendly service will put your worries aside.